If you're driving or busing on Canada Day, keep in mind that Gorge Road will see closures from Admirals to Tillicum, Belleville Street will see closures from Menzies to Douglas, and Government Street will see closures from Humboldt to Superior. Free bicycle valet service will be next to the legislature, and city parkades and downtown street parking are free all day. Buses will be running on a Sunday schedule with extra buses assigned to busy routes and times. Day passes are $5 and no alcohol is allowed on board. TD and Victoria Pride presents the Annual Memorial Dragball Game on July 1st at Vic West Park, sandwiched between Wilson St, Bay St and Esquimalt Road. The perfect sunny day to picnic in the park, while local drag talent entertains you with a game of baseball. Everyone is welcome to play, just make sure to arrive early so you can check in with event organizer David! Choose whether you’d like to play for The Queens or The Kings, and pick a name for your drag persona. To qualify, the Queens traditionally need to be wearing lipstick and a wig, and the Kings traditionally need to have facial hair… but since drag is all about gender-bending, teams are flexible. Organizers also have some items for you to borrow should you need some assistance. The Victoria Highland Games Association, in association with the Town of View Royal, is hosting its annual Canada Day Celebration at Craigflower Manor and property. Lots to do for families and the event is FREE! Lots of great activities including pipe band performances, multicultural dance and music, Highland Games Heavy Events competition, community association booths, childrens' entertainment area, Scotch whiskey tasting, licensed drinks, and BBQ! Tours of the historic manor will also be held, but are limited, so make sure to get there early and put your name on the sign-up sheet. The Gorge Pancake Breakfast starts at 8:30 AM at Craigflower-Kosapsom Park (Admirals and Gorge Road), and runs until 11 AM. Pick up a plate of pancakes for $3 and Starbucks coffee for $1. This is a very popular event, so if you don't make it before they run out, try one of the many food vendor trucks and carts that open early. Starts at 9 AM near the Gorge and Tillicum intersection. Come down between 8:30 and 9 AM to join the firetruck and police cars in the parade with your family! Kids often decorate their bicycles with flags and wear red. The parade travels along Gorge Road, ending at Admirals Rd. and the Pancake Breakfast. The Saanich Fire Dept will be participating in the parade at 9am, and then displaying Fire Prevention information at their tent from 9AM to 3PM, showing off one of their fire trucks and letting you explore their huge Emergency Command vehicle. Local and regional artisans selling handmade cards, natural soaps and body products, unique clothing, jewelry and accessories, small-batch baked goods, preserves and fudge, and much more. Professional and emerging visual artists exhibit their work along the scenic Gorge Waterway. See paintings, sculpture, photographs, ceramics, watercolours, jewellery and textiles, and meet and discuss the artists' work. This is an extremely popular attraction, get there early to beat the crowds! There's always a good mix of classic and vintage cars to admire, including European and domestic, hot rods, muscle cars, and race cars all shined up with their owners waiting to tell you all about them. The Hallmark Heritage Society will be opening the old one-room schoolhouse to the public on Canada Day. The Schoolhouse, at Admirals and Gorge Rd W., just behind the main entertainment stage, was the first school house in Victoria. Stay tuned for programming information closer to the event. Enjoy the many sweet and savory food and beverage vendors at the Canada Day Picnic. There will be over 25 food vendors including Mexican, gourmet pizza, fish & chips, smokies & hotdogs, Greek, burgers, fresh squeezed lemonade, mini-doughnuts, langos, ice cream, fruitsicles, shaved ice, baked goods, and cotton candy. View the live interactive map online to find a particular vendor. BC Transit is bringing along one of their new smaller busses for you to check out. They are also recruiting! Interested in a career as a Transit Operator? Come for a chat! Canoe rides offered by the Victoria Canoe and Kayak Club along the historic Gorge Waterway. Paddle in a voyageur canoe along the waters that were plied by the First Nations of the area. Rides are $2 and start at Craigflower-Kosapsum Park beach, which was a traditional summer home of local First Nations. Plenty of fun activities for the kids, including games, road hockey, bouncy castles and face painting. Starting right after the opening ceremony on the main stage and throughout the day at the other 3 stages, from 10 AM until 4 PM. Tap or click on the stage icons on the interactive map to see a list of performers. Delicious Strawberry Tea is served in the Victoria Canoe and Kayak Club building. Fresh strawberries on cake are served with tea, coffee, or juice for just $3 per person. Enjoy a break and an excellent Gorge waterway view from a historic house. Meet your community association board members at the GTCA tent located in Craigflower-Kosapsom Park. The tent serves as an information booth, the Lost & Found, and the Picnic control centre headquarters. You can also sign up for or renew your yearly membership. Join the Royal BC Museum for three days of free outdoor events in celebration of Canada Day. Huntingdon Manor Hotel, at 309 Belleville Street, will be hosting a Community Pancake Breakfast in their gardens overlooking Victoria’s Inner Harbour. Entertainment and activities will include all Canadian music, face painting, and activity centre for kids, little-known facts about Canada, and an on-site caricaturist. To commemorate the estate’s rich history, several staff will be dressed in period costumes throughout the day with a vintage photo booth for some unique and fun pictures! Donations for the pancake breakfast will be accepted with all proceeds going to the Victoria Women’s Transition House. The annual Canada Day Afternoon Tea at Venus Sophia on 540 Fisgard St. is always a favourite. Delicious and fun, the menu will feature classic Canadian eats and treats with a fancy twist, fit for a stunning Afternoon Tea service. From "Poutine Gratin" to "Bacon" quiches, and Salted Caramel Cheesecake to Maple Butter Shortbreads, your tastebuds will dance with happiness. On Canada Day the BC Museum's annual Penny Carnival offers fun for the whole family! Bring your pennies (you knew you were saving them for a good reason) and step right up to try your hand at an egg-and-spoon race, bean bag toss and other surprises. The Penny Carnival is taking place on the grounds surrounding Helmcken House and St Ann’s Schoolhouse. Both of these historic buildings will also be opening for the season and welcome you inside to discover more about BC’s past. The TD Victoria International JazzFest will have free performances going on in Centennial Square, including the Wes Carroll Trio, Jonnie 5 Brass Band, Lowdown with Kelly Fawcett, and Victoria's own Soul Shakers and Electric Timber Company! 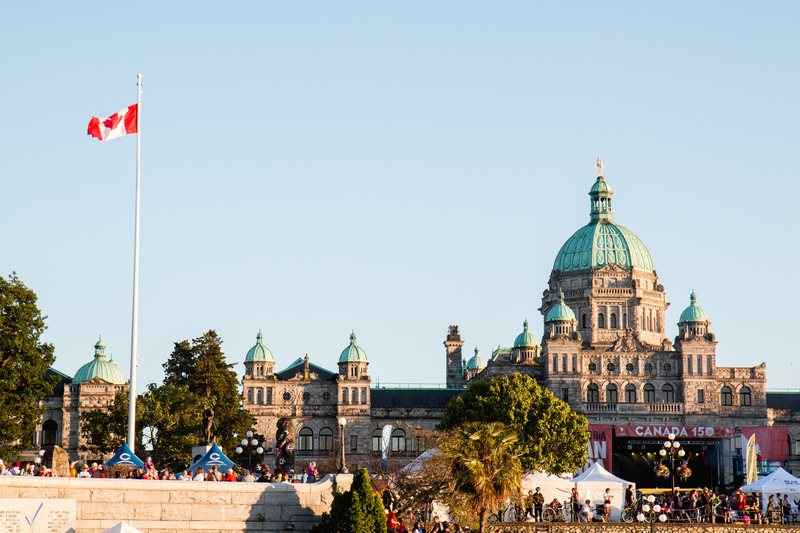 A Flavour of Canada will return with their international food village, sponsors' activity tents, and expanded family-oriented performances at Government St. and Belleville St.
Last year, Victoria set a record with 5,000 participants earning the title "Largest Living Flag" in the country! The annual Living Flag spectacle on the lawn of the Legislature will start handing out red and white t-shirts on-site starting at 12:00 PM. Participants will then be organized and arranged for the Living Flag photo to be taken between 1:30 and 2 PM. Celebrate Canada Day with the Royal BC Museum. Bring your pennies (you knew you were saving them for a good reason) and step right up to try your hand at an egg-and-spoon race, bean bag toss and other surprises. The Penny Carnival is taking place on the grounds surrounding Helmcken House and St Ann’s Schoolhouse. Both of these historic buildings will also be opening for the season and welcome you inside to discover more about BC’s past. At Vista 18 Restaurant in Chateau Victoria, Steve Grebanier Guild explores the borders of jazz, funk and blues. Old standards become shiny and new in these locals’ hands. Steve Grebanier guitar, Eric Hughes saxophone, Peter Dowse bass. Sean Drabitt has earned a reputation as a world class jazz bass player who spent most of the ’90’s in the vibrant jazz scenes of New York and New Orleans. He has performed in over 40 countries and currently resides in Seoul, Korea. The Sean Drabitt Quartet is performing a tribute to Jaco Pastorious, one of the founding fathers of bass guitar, and showcasing his most popular and challenging body of work. Tickets are for sale at the Victoria Jazz Society Office at 977 Alston St., and at the Royal & McPherson Box Office. Tune in to accompanying music on your radio with The Zone at 91.3 FM or The Q at 100.3 FM. Fashioned after the world famous "Diner en Blanc", Sidney will celebrate Canada Day with the 2nd Annual "Dinner en Rouge". Guests dressed in red and white will gather for a chic outdoor dinner along the waterfront in beautiful Beacon Park. The evening will include a silent auction in support of Slangspruit Primary School in South Africa. Find ticket information online here. Head to the Mary Winspear Centre at 2243 Beacon Ave for a tasty tradition, pancakes and sausages. $7 per breakfast or $20 per family up to and including 4 people. Coffee only is by donation. Stake out a spot early to catch the Sidney Days Parade as it runs through downtown Sidney. The Parade route begins along Resthaven Drive and turns onto Beacon Avenue. It continue to run the length of Beacon Avenue, turning right onto Second Street and ending at Ocean Avenue. Once the parade completes its route, people are encouraged to move to Iroquois Park to join in the Family Fun Fair. Be sure to arrive early as spots can fill up quickly. Enjoy an array of activities and games in Iroquois Park, including: life-sized Jenga, selfie booth, mini golf, bean bag launchers, life-sized hamster balls, face painting, inflatable obstacle course, food vendors, and the El Paso Train. You can also take part in carnival style games, the annual dog show, and watermelon eating contest! The Slegg Build-a-Boat is a classic during Sidney's Canada Day Celebrations. Teams are provided with materials to build a boat and then set sail on the Salish Sea at 4:30 PM to compete for the best boat. Fun and hilarity ensue as teams discover if their ship can sail. Come on downtown and wrap up Sidney Days with the popular Sidney Sidewalk Sale where Beacon Avenue is closed to vehicle traffic and transformed into an outdoor festival! Activities include a pancake breakfast, Kids Fun Zone, yoga, crafts, plein air art, Dog Chill Zone, Capital Iron Relaxation Lounge, IGNIO Circus, farmers alley, beer garden, live music, and Torque Masters car exhibit. Canada Day's biggest birthday cake is always served at Fort Rodd Hill and Fisgard Lighthouse National Historic Sites. Come celebrate Canada's special day and join the excitement. Be a kid again, dance yourself silly to the live music throughout the day, and take part in all the fun activities. Enjoy the food and snacks at the concession, but remember to leave a bit of room for a piece of the HUGE cake. Admission and cake are free! Join in the fun of Canada Day in Sooke at the Sooke River Campground, 2259 Phillips Rd. The Sooke Pipe & Drums & RCMP lead in the parade. Sooke Pipe & Drums, Royal Canadian Legion Br 54 Colour Party, dignitaries, and others with all the Territorial and Provincial flags of Canada will be paraded in. The Dignities speak on stage, the National Anthem is played followed by a First Nations prayer and speeches, then free Canada Day cake is handed out at 12:30 PM. Fun for the whole family - kids games, music and more! Bring chairs, blankets and have fun. Business & demonstration booths, races, crafts, Inflatable Play Zone, and face painting. This is a no alcohol and no drugs event, and no bikes, blades or skateboards are allowed on site (although bikes can be locked at the upper gate). There are no dogs allowed on site with the exception of help/guide dogs if you have your permit with you, and the dog is registered as such. Fireworks in the field at the Campground depend on weather conditions. There are no benches at the park, so make sure to bring your own chair or blanket. 10 PM: Fireworks in the field at the Campground! Dependant on weather conditions.